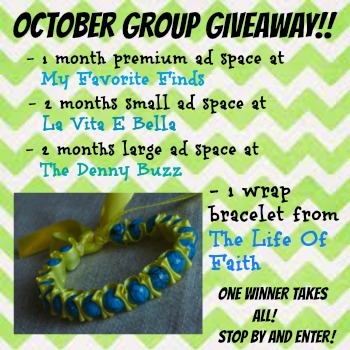 The Life Of Faith: October Group Giveaway! With less than 2 weeks left in October, it's about time I introduce my fabulous October sponsors right? They have all answered 5 questions about themselves just so you can get to know them a little better. Not only do you get to meet 4 sweet ladies, but they are also generously offering you some great prizes today! Don't miss out on the rafflecopter giveaway at the end of the post! Meet Carrie from My Favorite Finds! 1. How long have you been blogging?--I've been blogging for almost two years on My Favorite Finds, but for almost 7 on my personal family blog. 2. What is your favorite thing to write about?--My favorite thing to write about is almost everything :). That is why my blog is named "My Favorite Finds". It gives me lots of room to share recipes, crafts, and organization tips. 3. What is the inspiration behind your blog?--I started my blog of recipes, crafts, etc., because I didn't want to "clutter" my family blog with all that stuff. It's more of a journal of our family, and I wanted to share my ideas with others but not share EVERYTHING about my family with them. 4. What are three quirky things about you?--I cannot start my day without taking a shower, I never read a book more than once, and I don't like to wear socks. 5. What is your favorite thing about the fall season?--All the pumpkin recipes. I get a little baking obsessed in the fall. Carrie is generously giving away a premium ad spot on her blog for the month of January! P.S. Carrie is having a BOGO ad space offer for November/December. When you buy one ad, she will send you a code for an additional free month! Most of you have already met Elisabeth from La Vita E Bella. If you didn't get the chance, check out her sweet guest post on falling in love that she wrote on The Life Of Faith earlier this week! 1. How long have you been blogging? Really for just over a year. Technically for almost 2. 2. What is your favorite thing to write about? Romance, love, and life as a newlywed. 3. What is the inspiration behind your blog? I just share our story. I find the beauty in the everyday and hope by sharing it I encourage others to do the same. 4. What are three quirky things about you? I was born in Tokyo, I finger spell words when I'm concentrating, and I sleep with a down comforter 12 months a year. 5. What is your favorite thing about the fall season? I love the layers, but really I anticipate the baking. Scents of pumpkin, cider, hot chocolate, any kind of chocolate, its heaven. Elisabeth is giving away two months small adspace on her blog! 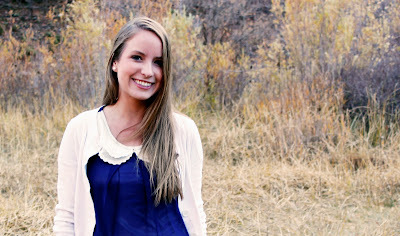 Meet Brittany from The Denny Buzz! The Denny Buzz is all about the daily buzz of our family of three...from our weekend adventures, to cooking with new recipes, making crafts, and more! 1. The Denny Buzz was started in May 2010! Seems just like yesterday!! I was an off/on blogger at first but really started being a consistent blogger when I was pregnant. 2. I love writing about our daughter and the fun adventures we get to have with her! 3. My amazing husband and daughter are my inspiration. Even though I can't fully express in words how much they truly mean to me, blogging about the two of them and our special times together is so much fun! 5. I love fall candles! To me fall starts when my husband and I go buy a fresh new fall-scented candle! This years is Sweet Cinnamon Pumpkin from Bath & Body Works! Brittany is giving away 2 months of large 200x200 ad space at the Denny Buzz! Last but not least, we have Stephanie from A Blessed Home! Stephanie wasn't able to answer the five questions, but she would still love for you to stop by her blog and say hi! Don't miss out on this awesome candle holder Stephanie is giving away at A Blessed Home! And just because I am feeling extra generous this month, I have decided to include one of my bead wrap bracelets in this month's giveaway! If you don't like these colors, you can choose from my selection at Something Old, Something New! If you are interested in being a sponsor next month, now is the time to sign up! Check out my sponsor info here! Great giveaway!! Looking forward to checking out these new-to-me blogs! Thanks for offering the fantastic giveaway! What great blogs to won ad space on! Awesome giveaway! Especially from blogs I already know and love! Some of my posts have been featured on the Daily blogs before, but not The Life Daily. So, I was very excited and wondered what story of mine do they have! Well, it was one that I shared and it is this post of yours. Yes, your post has been featured. 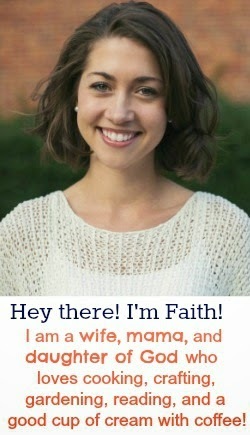 :) You have to scroll quite a ways down before you see a tiny picture of me with the Life of Faith next to my name. Yay for giveaways! Have a great weekend, girlie! New follower from Mommy Moments blog hop. Thanks for hosting. 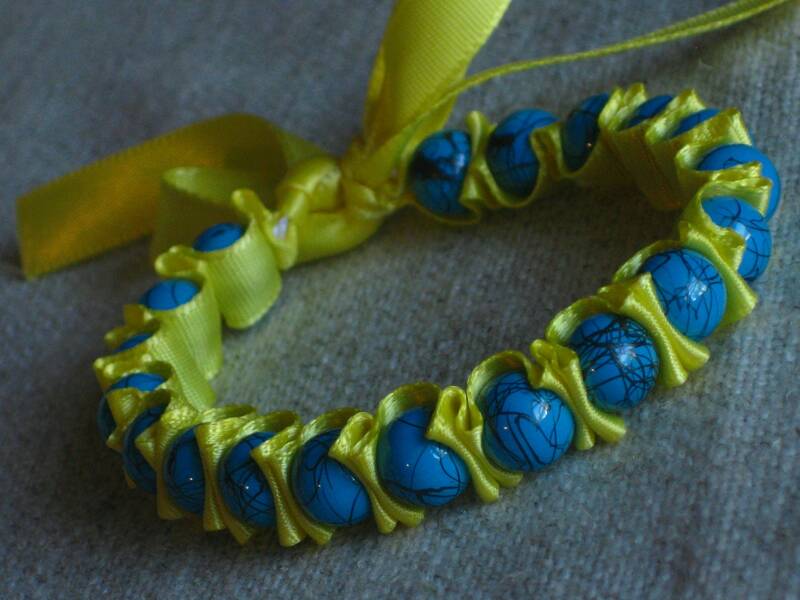 This is the 2nd time I've entered win one of your adorable bracelets, and I hope I win this time!!! :) Great giveaway, thanks to you and all your ladies!